The Choice – ‘tipping point’ for an Outpouring is close at hand! “The lasting proviso which is required to access the full benefits of My Spirit is reaching out with great extended arms as I seek to surround My People,” says the Lord. “My measuring rod is going backwards and forwards, as My Remnant decide to receive peace instead of pain, and light instead of darkness. The choice is theirs and has always been theirs,” says the Lord. “But I grow weary of tarrying whilst My People waiver to and fro; and show fear, whilst stepping back from the wondrous depths of My Spirit. My Creation must walk in tandem with Me,” says the Lord, “as alignment with My Ways, however unusual or uncomfortable, is My requirement for a great breaking down of barriers that now batter My People with such force. “Step Out, My People, and be not afraid of those who might bruise in Word or Deed. For My Servant, Stephen, feared not and saw all of Heaven, as He declared My Power and My Glory. And I say to you in this hour, that tapping into My Power must not come through trembling lips and hidden gestures; but by bold declarations and actions; as My People move with pinpoint accuracy, led of My Spirit in the next days ahead. Be bold, and be fearless, and see My Spirit increase as the days grow dark,” says the Lord. “A Blood Moon with an eclipse in 2018, was the first true heavenly sign of the beginning of the new era of My Rising,” says the Lord. “And I shall cause My prophetic minstrels to gain prominence with a greater release of My Spirit, which shall curtail the power of the dragon. And I shall cast him aside like a limp cloth as My People stand encircled by My Glory and speak the Word of Truth to the masses. The tide of My Spirit has shifted and shall gain momentum as the Harvest comes into My storehouse. Take your positions, My People, for I have marked this season for change,” Amen. Given to Leisa Ebere on June 1st, 2018. For more delivered by Leisa click the ‘Ebere’ tag below. The first prophetic word she brought is God’s Mandate for the Prophetic Profiling of our Nation, followed by a very powerful collection known as The UK Nationwide Circuit Prophecies, the first of which promises the Lord will give His prophets the ability to see clearly ‘My numbers’ in 2018! 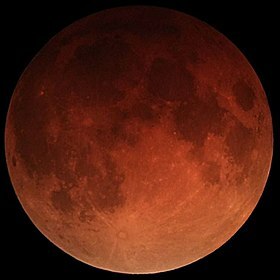 This entry was posted in Holy Spirit, Prophetic, The Bride, The Kingdom and tagged Blood Moons, Ebere, Prophecy-today, Signs-Wonders by Richard Barker. Bookmark the permalink. Richard this really witnesses with me, only this afternoon four of us ladies met and Jules was telling us about praying for three people within ten days who were immediately healed (one walking down some pub steps, who was so shocked the pain had ‘he said I want to marry you’ . Two colleagues l at a well known store that she works in one, with a frozen lower back and one who was in agony in their lower leg. All were instantly healed and it opened up and wonderful way of sharing how good God is and how willing He is to reach out to them in a relationship. Jules said afterwards it was as though its been building and building and now its just gushing forth. Thank you for posting this. WOW Praise the Lord Lynne because I’d emailed Leisa that I intended scheduling this for publication tomorrow or Saturday for reading and weighing over the weekend. That is, it was to follow more material on Brexit because it warrants standing alone. I thought my reply had actually been sent but it had somehow disappeared whilst corresponding on other matters! SO I thank the Lord and you for the privilege of conveying His Word. this ties in with the EU vision wherein He reminded that the body has a part but first has to truly repent, exercise true humility, in order to exercise kingdom authority. Thanks for re-blog Paul and on Leisa’s behalf (will inform her).